Sometimes, that noodle craving just hits and you need something easy and quick to satisfy your hunger. This recipe uses dry noodle nests instead of fresh, which although means using more than one pan, is cheaper than the fresh packets you can buy and they last longer too! 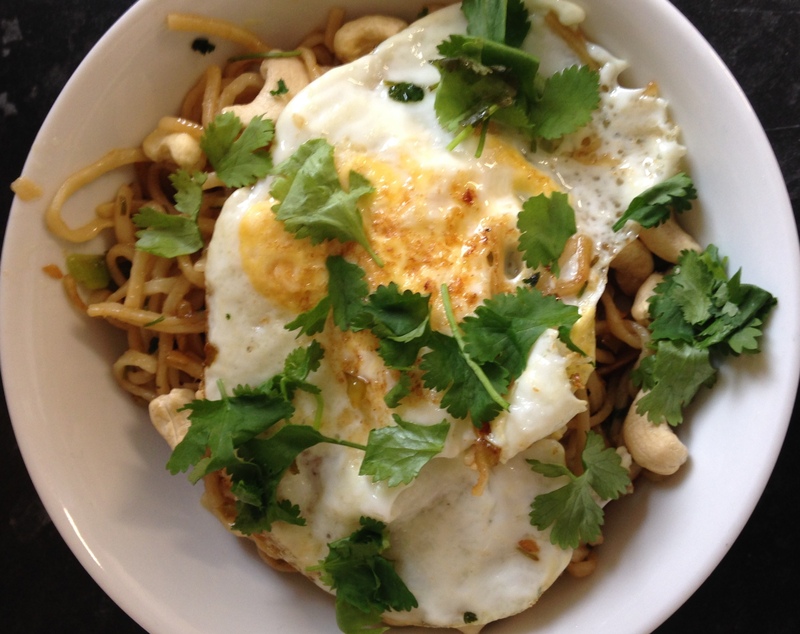 I also really love topping my noodles with an egg, it adds something a bit more to the dish alongside the cashews to make it a little more interesting than just a pot noodle substitute. You could also have this with a little bit of lime juice if you have it, however if not then an extra few drops of soy sauce will do the trick! Put a small pan on a medium heat and fill with water until the noodle nest is covered, then put the lid on and leave to boil for 3 minutes. While the noodles are boiling, finely chop your chilli, spring onions, garlic and coriander stalks. Put a medium frying pan on a high heat and add about a tablespoon of oil, when the oil is hot add the onions, garlic, chilli and coriander stalks and fry for 2-3 minutes. While these are frying, take your noodles off the heat and drain, then add to the frying pan. Stir in the noodles, then move to one side of the pan, add a tiny bit more oil and crack the egg into the other side of the pan. This saves washing up, trust me! 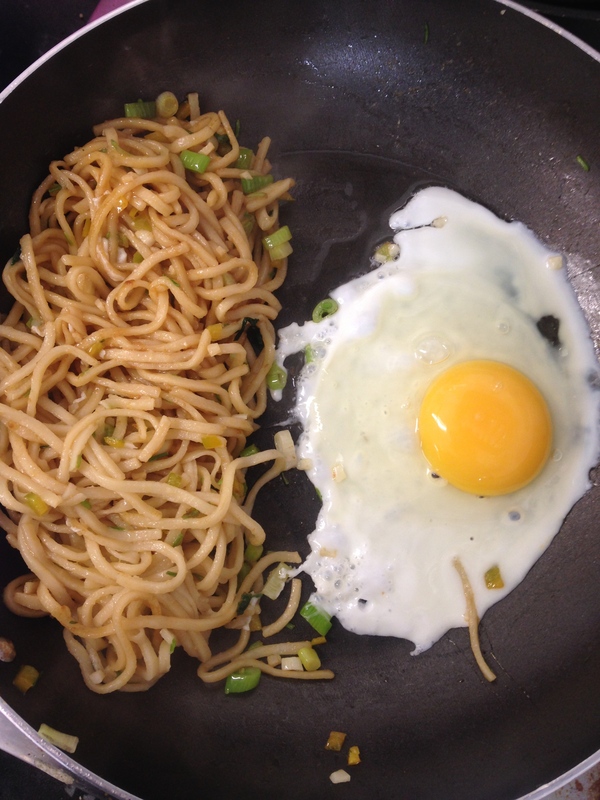 Fry the egg however you like it, then add the soy sauce to the noodles and mix them about a bit with some tongs, or failing this two forks, keeping them separate from the egg. 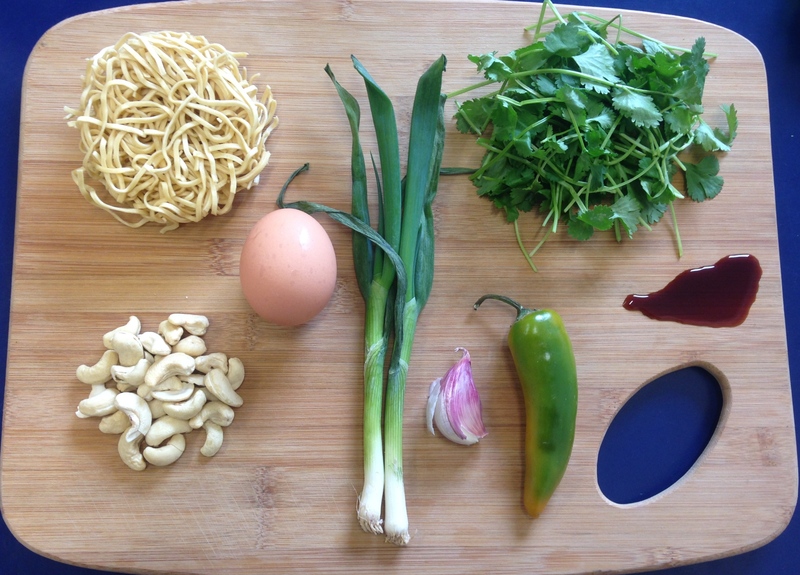 To assemble, put the noodles into a bowl, sprinkle with cashew nuts, top with the egg and then use some scissors to chop the coriander over the dish. This is when you can either squeeze over some lime juice or simply a few extra splashes of soy sauce. Now dig out your chopsticks (or fork..) and enjoy!